Lucinha runs a ‘quitanda’ called “O Bar de Dona Lucia” in the Ribeira district of Salvador. A quitanda is a shop that has been set up in the front room of a house; it also means a small grocery shop. She sells mangos, salad leaves, spring onions, but mainly sells beer alongside home-flavoured cachaca and ginger/tamarind spirits. Customers can drink at the bar or at four plastic tables out on the pavement/street. Lucinha doesn’t have a licence to sell alcohol. The licences are expensive. Occasionally, the inspectors come by and she says it is not possible to pay for a licence (she makes profit of approx R$10 (or £3) from each crate of beer she sells). She visits the police station, explains her situation and they turn a blind eye. The mangos are almost entirely profit as she buys them either from street vendors who visit her shop or she goes to the market. 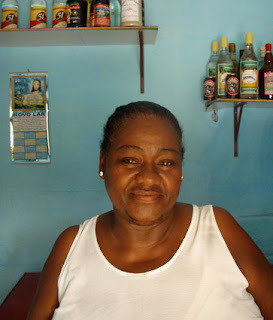 She started the shop with a couple of bottles of Cachaca and a carton of cigarettes from her father-in-law. Now, twenty years on, with the support of the business, the house has grown room by room and now stands two stories high. More importantly, it supports her, her husband, her two daughters and her son’s ex-wife and three children, all of whom live with her in the house.